Des Moines Public School administrators, the School Board, and members of citizen and employee advisory committees are at work on developing the FY 2015-16 budget, which begins on July 1. The budget must be completed and submitted no later than April 15. On this page you may read a copy of the proposed budget, view presentations made at previous budget-related meetings, see key dates in the budget process, and access other budget information. 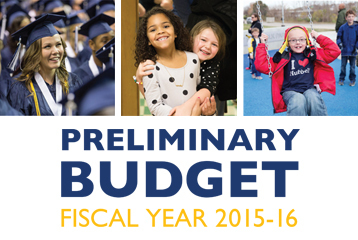 The FY 2015-16 preliminary budget is now available online. The preliminary budget proposes maximum expenditures of $530,981,624. You may download a PDF of the document by clicking here or on the image above, or scroll to the bottom to see it embedded on this page. Seek input from the Citizens’ Budget Advisory Committee (CBAC) on budget issues. Seek input from the Employees’ Budget Advisory Committee (EBAC) on budget issues. Focus on strategies to close the achievement gap.